"There in the midst of humankind, is the dwelling of Christ, who asks you to dry every tear in His name, and to remind whoever feels lonely that no one whose hope is placed in Him is ever alone." Our ministry seeks to fill a spiritual need in the DTES. 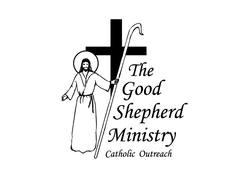 While there are many places people in need can go to find a free meal or free clothing, we believe there is a hunger for human interaction and spiritual comfort, someone to say that they are not walking this path alone, that someone cares about them and what is happening in their life, and someone to offer support, services and spiritual guidance when needed. We minister to anyone who seeks us out on our nightly walks. We use candy bags with prayers and/or notes of inspiration tucked inside as a vehicle to start conversations. On any given night we might give out anywhere from 30-100 bags of candy. In other words we are able to say "God bless you" or "God loves you" to countless people per night. No encounter is ever the same. We are often blessed with the opportunity to learn about the person's life, their troubles and their joys. 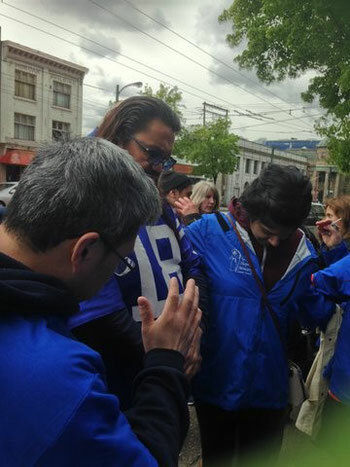 Even more beautiful is the opportunity to gather as a team with an individual and offer up a communal prayer right there on the sidewalk. We also hand out rosaries, small bibles, gloves and socks, scarves and hats to those who ask. If someone is in hospital or will be in the near future, we will arrange a hospital visit. When we go out for a nightly walk we never really know what we will encounter. No walk is ever the same. Sometimes they are triumphant, but other times sad and frustrating. Other times they are hectic and loud, but we also experience walks that are quiet and contemplative. You can take a more in depth peak into our work by reading our blog featuring posts from different volunteers.